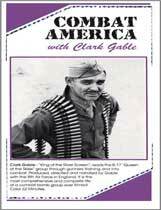 USAAF documentary in color and narrated by Clark Gable. Follows a B-17 bomb group from training into air combat with the U.S. 8th Air Force in England. Missions over Germany are shown: flak and fighters!